Are you a Point of Sale (POS) technology job seeker, and tired to digging through massive generalized job boards looking for your dream job? Are you a POS employer, and tired of dealing with pricey job boards that are not providing the professionals that you need? Point of Sale technology touches every industry today – retail, restaurant, and banking are just a small number of POS system users. Up until recently there was a lack of resources on the web for POS technologists regarding career searching. The POS Careers team has come together and made a commitment to job seekers and employers, to build the premier career hub for Point of Sale technology. 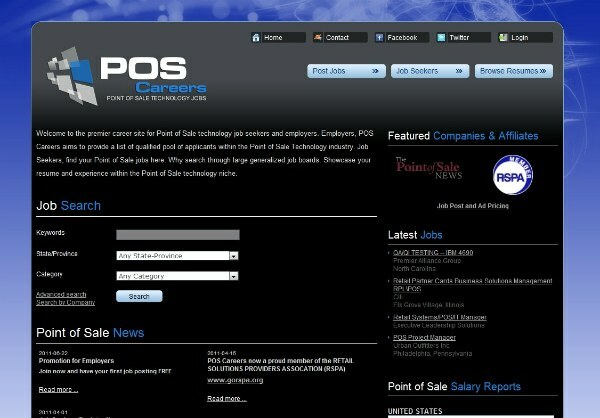 POS Careers strives to provide a comprehensive pool of qualified applicants within the Point of Sale Technology industry. The site is visited by job seekers who are not only IT savvy, but are also POS experts within their industry. POS job seekers can showcase their resume and experience within POS Technology circles, without having to use larger job boards. The POS Careers team is located in beautiful British Columbia Canada, and is comprised of POS professionals currently working and with extensive experience in the POS industry circles, including the Point of Sale News. They are working in partnership with industry affiliates, companies and organizations to branch out and grow their network reach. So you can rest easy knowing that they are working towards your employment goals.